It's been an emotional roller coaster for New Orleans Saints fans in the past 48 hours, as word spread that starting defensive tackle Nick Fairley was diagnosed with a heart condition that potentially could force him to end his 7-year NFL career and retire at age 29. Now comes word via a "2nd opinion" from well-known sports doctor David J. Chao, who formerly served as the head physician for the San Diego Chargers, that Fairley may just be able to play this year and beyond, after all. In his article yesterday evening published by the San Diego Union-Tribune, Chao says this about Fairley's condition, and his prognosis for the upcoming season and the remainder of his professional playing career. "Just because the heart evaluation has become public, that doesn’t mean Fairley’s cardiac condition is worrisome. He and the Saints are smart to get a full work-up. Without having seen Fairley's records, the two main possibilities are an arrhythmia (abnormal heartbeat) or myopathy (heart muscle abnormality. The most likely possibility is a hypertrophic (enlarged heart) over a dilated (expanded/weakened) myopathy. Doctors are very aware to avoid a “Len Bias” type sudden death. The markers are set very low to detect even potential mild cases as the goal is to prevent every sudden death. The current secrecy with Fairley is somewhat worrisome. However, given that it is the offseason, clubs have no duty to disclose any injury or medical information. Perhaps there is no increase of cardiac myopathy at all and the Saints are just being careful given his new four-year, $30million contract. There is also the outside possibility of buyer’s remorse from team management. Fairley was detected to have a heart condition at the Combine in 2011. He was projected to possibly be a first overall pick, but after his measurables was downgraded slightly and ended up being selected by Detroit with the 13th pick in ‘11. Perhaps the heart issue played a small role in the slight fall. Perhaps not. Since then he has undergone yearly physicals with the Lions and then passed a physical with the Rams in 2015 and Saints in 2016. Multiple doctors were aware of the heart issue detected at the Combine and would be careful to follow up. This is Fairley’s second year with New Orleans. Certainly, he had a full physical before signing. He played with the condition at Auburn and then for six NFL seasons without issue while other orthopedic ailments have landed him on injured reserve. Perhaps something changed with his annual team physical, or it is possible his previously detected heart condition has changed or worsened. The hope and expectation is that the additional tests are all precautionary. Chances are excellent that Fairley’s career is not over and the headlines are overstated." If Chao's prognosis is accurate, then the reaction to the news of Fairley's condition surely may have been blown out of proportion, though it's human nature -- especially that of super-passionate Saints fans -- to react to the news in the manner which they have during the past few days; with the multiple reports that one of the team's key contributors could not only miss the upcoming season, but could be lost permanently. Perhaps more importantly, it means that Fairley might still be able to continue participating in the sport that he has loved playing since his childhood, without having the fear of endangering and risking his health and possibly even his life, while doing so. This could end up not being nearly as bad as Saints fans anticipated; and turn out to be nothing more than just a simple case of being "extra careful", by all parties involved. Ultimately, the decision to play or not to play will be a choice that Fairley will have to determine, for himself. 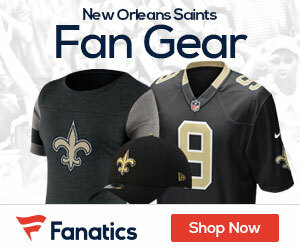 Is Saints DT Onyemata Up to the Task of Replacing Fairley?